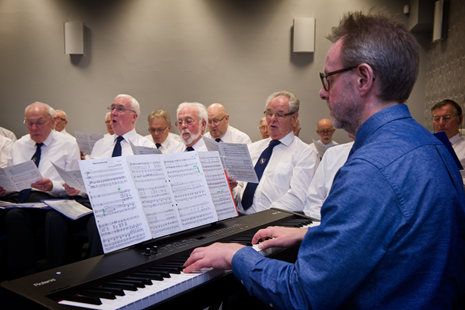 Derek Brett pictured above during Ashington and district Male voice choir rehearsal March 2017. After graduating from the London College of Music and the University of Ulster, Derek began his musical career as a trombonist and pianist in HM Band of the Irish Guards. He has taught music in special schools both in London and the North East and after completing an MA in Cultural Management at the University of Northumbria, had a spell working in venue management in both theatre and cinema. Derek has always enjoyed accompanying and as well as playing for ADMVC, he is also the accompanist for Lemington Male Voice Choir in Newcastle and has also played for Newcastle Musical Theatre Company, West End Operatic Society, Whitley Bay Operatic Society and numerous instrumental examinations and school concerts and productions. 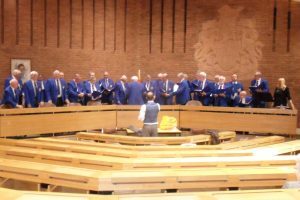 Our leadership has been taken up by Neil Morton our friend and past leader who has returned to the role of MD to assist the choir in meeting its commitment for the foreseeable future. Neil no stranger to the choir bring his musicality and experience together with his wit and charm that makes performances and rehearsals a pleasure.